By Walt Hendrick, Andrea Zaferes, and Craig Nelson MD. 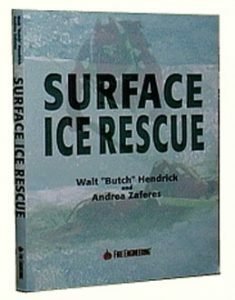 If you took a recreational rescue diver course or recreational search and recovery course, you probably learned a number of different search techniques, such as the expanding square or circular search using a line. 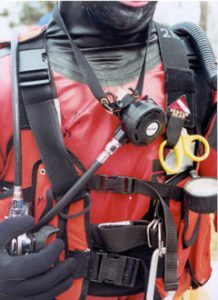 These techniques might work well for high-visibility, buddy diving, but they are not very effective for blackwater, technical, public safety diving applications. Public safety diving for the most part is done in low- or no-visibility blackwater, sometimes under harsh weather conditions, and often without advance notice. Even teams near beautiful, clear, ocean water may need to search in blackwater ponds, swamps, and rivers. That kind of water demands a system that allows the team to search an area of bottom rapidly and with the confidence that nothing in the area has been missed. Searches must also be repeatable. More importantly, than the search pattern you choose, though, is the ability to keep team members safe during the search. Before you decide which type of search pattern to use, you must first consider whether it realistically allows you to quickly and safely rescue an entangled or entrapped diver. If not, you must choose a search pattern that will allow you to do so. Once the area that will be searched has been established, it is up to the Dive Coordinator to decide the type of search pattern that will be used. The type of pattern chosen is based on several factors, including the area the from which the tender is working, number and type of obstructions on the bottom, bottom contour, current, depth, the object of the search, the amount of area to be covered, and tender-diver experience with patterns. The Dive Coordinator should take into account all of these factors, and choose a pattern that offers the safest, most thorough method for the current situation. Let us examine some commonly used search patterns. Bear in mind that the techniques may have to be modified in keeping with the specific requirements of the incident, the capability of personnel, and the safety of divers. Remember, too, that adequate training is essential for safe and effective operations. Figure 2: The arc search is the most common type of search. The diver is swept back and forth in an arc at the end of a taut tether, gradually working towards shore. The arc search is one of the simplest, most effective, and most frequently used search patterns. In an arc search, the diver is simply swept back and forth in an arc at the end of a taut tether, gradually working towards shore. Also known as a half-moon search, it allows a rapid search of bottom area, and is easily used even at the ends of jetties or on an unsmooth shoreline. It allows a much faster bottom search than jack-stand searches, and covers more area quickly. An arc search works relatively well in non-flat, contoured-bottom situations and extremely well in searches for large objects, such as automobiles. This technique is not ideal for areas with heavy bottom weeds, since the line can become caught in the grass, causing divers to lose their patterns. Another problem is that the enormous weight from pulled grass can be caught in the line, and become an entanglement hazard not only for the primary diver, but for any back-up diver coming down the tether to assist. To conduct an arc search, a diver is first deployed on a tether to the most remote point of the area to be searched, but no farther than 150 feet (see Chapter 16: Making the search). The tender, who remains standing at one, marked location, signals the diver to descend. Once on the bottom and situated, the diver signals the tender that he is OK, and ready to begin searching. The tender then signals to the diver to go left or go right, as appropriate for the situation. The diver begins moving in the direction specified, being sure to keep the tether taught between himself and the tender. As the diver moves, his path will create an arc, with the tender as the center. Usually, the arc will cover a quarter-circle. Once the diver reaches the end of a sweep, the tender will signal him to stop and face the line. The tender then pulls the diver in an appropriate amount, from two to five feet closer. (See “How far should a diver be moved between sweeps” below). For example, if the diver is searching for a full-size, human body, the tender should pull him in about three feet, which will let each of the diver’s sweeps, with a width of the diver’s arm span, overlap by a few inches. 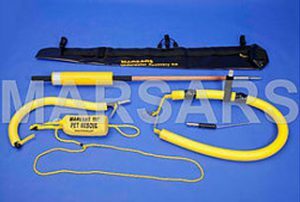 If the diver is searching for a child or other small object such as a weapon, he should be pulled in about two-and-a-half feet after each sweep. To be sure that the diver stays within the boundaries of the search area, the tender should pick a landmark, buoy, or a range on each side of the search pattern. When the tether gets in line with those markers, the tender knows that the diver has completed one sweep, and it is time to turn around. For a faster search of a wide area, arc searches can be combined to create windshield-wiper patterns. 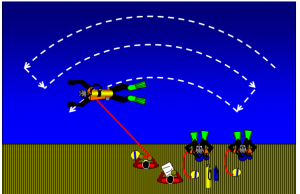 In this case, there are two primary divers searching partially-overlapping areas, each using an independent arc pattern. The two divers move left and right at the same time, thereby giving the tether lines a movement that looks like a car’s windshield wipers. When setting up for a windshield-wiper search, tenders should generally stand as far apart as they send out the divers initially. Hence, if divers are initially sent out 60 feet to begin the search, their tenders should stand about 60 feet apart. However, if a steep, sloping bottom or other restrictions require search patterns to be narrower than the usual 90 degrees, tenders will need to stand closer together. Keeping the divers moving at the same pace is up to the tenders. If a tender sees that his diver is getting too far ahead, a single line signal should be sent to tell that diver to stop. Figure 3: With a back-up diver and 90%-ready diver in place, windshield wiper searches allow more efficient use of personnel. Once the other diver in the windshield-wiper search is caught up, the tender should once again tell the diver to begin searching in the appropriate direction. Windshield-wiper patterns allow efficient use of personnel. While each diver has a back-up diver and back-up tender on standby, those back-up divers serve as 90%-ready divers for one another. Hence, for two search operations, only two other divers must be on shore, but note that they must be fully equipped and ready to dive. If a back-up diver is called in by either primary diver, the other primary diver should be stopped, and, if the situation demands, slowly brought to the surface and to shore. Otherwise, there is a risk that two divers may suddenly need assistance and there will not be enough help for both. Of course, whenever the back-up diver is deployed, the other back-up diver rotates into the 90%-ready diver position. The primary divers in a windshield-wiper cannot act as back-up divers or 90%-ready divers for one another. In an emergency, there is simply not time for one diver to surface, swim to the other diver’s tender, snap in a contingency line, and descend. Furthermore, it would mean sending down a back-up diver who has already been searching and does not have a full tank. The pier walk search, often referred to as a box search, is one of the most efficient, thorough search patterns possible. Because it covers a rectangular area, it does not leave out wedge-shaped pieces of bottom that must be spot-checked. It is also a very simple pattern, easy to follow and easy to profile. It works well for searching large areas, and when searching a long, straight shoreline. Figure 4: In a pier walk search, the tender and diver move together along a straight path. The pier walk technique must be done where there is a long, straight shore, dock, pier, or other area for the tender to walk along. The diver is sent out a planned distance and descends. The tender signals the diver to stop and face the line, and then go to the left or right (depending on how the search was started). Unlike the arc search, though, the tender moves with the diver as a unit, parallel to each other. Upon reaching one end of the search area, the tender signals to the diver to stop, and both stop moving. The tender then pulls the diver in an appropriate amount for the object sought and signals the diver to go the opposite direction. Both diver and tender begin traveling back along the shoreline, with the tender walking exactly the same path, and the diver searching next to the first sweep. The process is repeated each time the tender reaches the end of the search area. If a single diver cannot search the entire area, a fresh diver can be sent out to take up where the previous diver left off. When using the pier walk technique, tenders must bear in mind to pace the divers as closely as possible by making sure that the tether is perpendicular to shore at all times. Going too slow or too fast puts an angle on the tether, thereby pulling the diver in too far, and causing areas of the bottom to be missed. Moving too quickly also puts a bow in the line, again pulling the diver in too far. Figure 5: A double pier walk can be an effective combination of resources. Note how one tender will have to duck the other tender’s line. Pier walks can also be set up as double pier walks, with two diver searching different, but adjacent pier walk patterns. One diver works near shore, and the other diver workds twice as far out as the near-shore diver, in order to prevent lines from becoming entangled. Tenders walk separate paths next to each other, but note that one will have to duck under the tether line of the other when they pass. 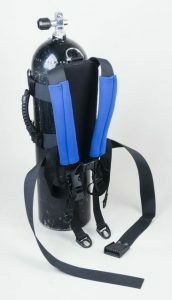 Back-up divers can be used as with a windshield-wiper pattern. 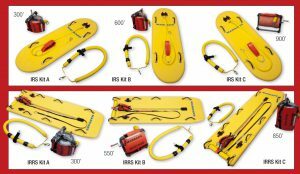 We here at Team Life guard Systems believe it is critical that rescue personnel get the quality of training that Team Life Guard Systems, Inc. has to offer. Here at Team LGS, we will prepare you for real life situations, and teach you how to think in difficult situations so that at the end of the day, you can go home.